Researchers are launching a new project to monitor California's kelp forests for radiation from the Fukushima nuclear power plant in Japan. 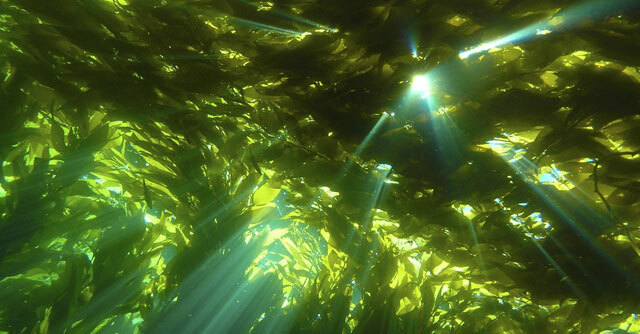 For Kelp Watch 2014, as it's called, scientists will fan out this year along the California coast, to collect kelp and find out if it has absorbed any radiation from the 2011 meltdown. "I've gotten calls from people who are coming here to surf, people who live along the coastline, asking me, 'Is it safe to go in the water?'" said Steven Manley, a biology professor at California State University, Long Beach who created Kelp Watch 2014. His plan is to measure radiation levels in kelp three times in multiple locations between the Oregon border and Baja California from mid February through next winter and make the results public. "Part of the reason for doing this is because the public is very freaked out by all this talk of radioactivity," he said. "If they can actually see the numbers and a commentary as to what they mean, hopefully that'll put them at ease." Kelp forests, he said, are a good indicator. For one, they're all over the place. "You can find them along the entire California coastline from San Diego all the way up to Del Norte County," Manley said. Plus, kelp acts sort of like a sponge, taking in whatever is in the seawater on the surface of the ocean. "It's sort of like having a large Geiger counter stretching the entire coastline," he said. Manley did an earlier study of Fukushima radiation and kelp. A month after the accident, he found radioactive iodine in kelp on the West Coast. The iodine had traveled from the nuclear power plant through the atmosphere, and has a very short half-life. So it got here quickly and disappeared quickly. Within a few months, he said, it was gone. The radioactiviy posed no health risk to humans, he said at the time, and had no effects on the giant kelp, or on fish or other marine life. Now attention is directed to the radiation traveling in ocean currents, which are much slower than the jet stream. Scientists think that could begin hitting California shores in the next couple years. By measuring radiation in kelp forests up and down the coast, Manley said he hopes to find out if and when it enters the kelp forest ecosystem. "If it gets into the kelp, certain fish feed directly on the kelp. Other fish feed indirectly by eating other organisms. The fish are going to have some in them," he said. "Now, is it enough to worry about? Probably not. But people have the right to know what's there." Manley and volunteers from 19 institutions (this is, at this point, a project composed completely of researchers working pro bono) will send their kelp samples to Kai Vetter, a professor at the University of California, Berkeley and head of the Applied Nuclear Physics program at Lawrence Berkeley National Laboratory. Vetter has been measuring signals from Fukushima here in California since the accident. While sampling rainwater in 2011 and 2012, Vetter and his colleagues found extremely low levels of radioactivity from Fukushima. A week after the accident, for example, they reported that a person would have to drink 632 liters of Berkeley rainwater – 166 gallons – to be exposed to the same level of radiation as a passenger experiences during a round-trip flight between San Francisco and Washington D.C.
Once radiation from Fukushima does arrive on the West Coast from the ocean, Vetter said, he expects it will be in miniscule amounts. "The concentration of radioactive materials which will be washed ashore here has no impact whatsoever on our daily life," he said. "The levels we are measuring, they will not be harmful. They will not have any measurable health impact on humans or any detrimental effects in marine biology." Despite several recent online videos and blog posts claiming that Fukushima radiation is causing widespread contamination of the West Coast and harming fish, scientists say their research so far shows that is not the case. Researchers from Stony Brook University in New York and Stanford University’s Hopkins Marine Station tested Pacific Bluefin tuna after the 2011 Fukushima incident. They have published research showing radiation levels were low – less than what people are exposed to by eating a banana or other potassium-rich foods that contain naturally occurring radioactive isotopes -- and have been falling ever since. The California Department of Public Health earlier this week, released a statement responding to radiation concerns, saying "Information from Federal agencies, State programs, as well as the Department’s own sampling results, conclude there are no health and safety concerns to California residents."